Our external eye structures are exposed to many infections and injuries because they are exposed to the environment. It is critical to maintain external eye health since it serves to protect the critical internal eye structures. Several external eye diseases even carry the risk of causing permanent damage to vision if left untreated. The tear film in the human eye is a very complex fluid. It is secreted by various glands around the eye. The tear film has mechanical, lubricating action and protects the eyes from harmful bacteria, allergens, and other infection- causing substances. Tear production and thickness begins to decrease around age 40. This process is progressive and by the time we reach our 70s to 80s, the tear film is rather watery and not an effective barrier against scratching of the eyes or bacterial invasion. Ironically, one of the surprising symptoms of dry eye syndrome is excessive tearing. As this is a very common problem, we feel that everyone should use artificial tears if they have chronic dry, scratchy, or irritated eyes. The first line of defense is using artificial tears at bedtime and in the morning. 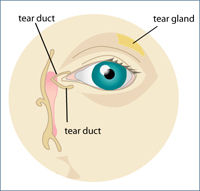 If artificial tear supplementation does not give sufficient relief, making better use of the body’s own tears is an effective treatment mode. This can be accomplished by blocking the tear ducts with punctual plugs. After an evaluation is done with several tests to establish the quantity and character of the tear film, plugs can be placed in the ducts “puncta” that drain tears away from the eyes, and retention of a better tear film can be achieved. Dr. Garrett feels that one of the biggest advantages of punctal plugs is that the patient retains his/her natural tears with the natural lubricating and bacteria fighting enzymes that cannot be duplicated in an “artificial tear”. Blepharitis is a common external eye condition related to persistent inflammation of the eyelids. This condition frequently occurs in people who have a tendency toward oily skin, dandruff, or dry eyes. Some people may develop an allergy to the bacteria that are present on the eyelids. Blepharitis can lead to more serious complications, such as inflammation of the cornea, and it can also predispose a person to styes. Blepharitis can develop in childhood and continue throughout life as a chronic condition, or it can spontaneously develop later in life. At least twice a day, wet a washcloth with warm water, wring it out, and place it over the closed eyelids for a minute. Rewet as it cools, two or three times. This will soften and loosen scales and debris, and help melt secretions from plugging oil glands near the lashes. Wet a cotton swab with water and a small amount of baby shampoo. Gently scrub the base of the lashes on the upper and lower eyelids, then rinse with water. Antibiotic ointment is sometimes prescribed, which is applied to the lower eyelids. Medications alone are not sufficient. The application of warmth and detailed cleansing of the lashes are the key to controlling Blepharitis. A stye is caused by a bacterial infection and appears a tender red lump on the eyelid. Most styes occur along the edge of the eyelid because the bacterial grow in the follicle of the eyelash. As it grows, the eyelid becomes swollen and painful and may even water. Most styes swell for about 3 days before they break open and drain. Most styes heal in about one week. An internal hordeolum is caused by an infection in one of the tiny oil glands inside the eyelid, and appears as a small bump. A chalazion is caused from the blockage of an oil gland in the eyelid. It forms a hard lump or cyst under the skin of the eyelid. Chalazia grow more slowly than styes and may interfere with vision when they become large. Most Chalazia go away in a few months without treatment. An internal hordeolum can turn into a chalazion if it does not drain and heal properly. Apply warm, wet compresses 3 to 6 times a day. This usually helps styes and Chalazia to heal faster. It may also help open a blocked pore so that it can drain and begin to heal. Use an over-the-counter ointment or medicated pad. Do NOT wear eye makeup or contact lenses until after the stye or chalazion heals. Some styes require an antibiotic ointment, eye drops or pills if the infection has spread to the eyelid or eye. Your doctor may need to pierce (lance) the stye or chalazion so it can drain and heal. Never try to lance it yourself, as it may cause a worse infection to develop. Wash your hands before touching your eyes. Don’t rub them as this can irritate your eyes and invite bacteria. Replace eye makeup, especially mascara, every 6 months. Used makeup can grow bacteria. Treat any eye inflammation promptly to avoid complications. Wash eyelids regularly with a mixture of baby shampoo and warm water.